In this tutorial I will focus on creating upgrade for my weapons. Creating upgrade functionality is easy but it’s taking lot of time. Create new UMG Widget named UI_Armory_Weapons. For now let’s add necessary variables and dispatchers. 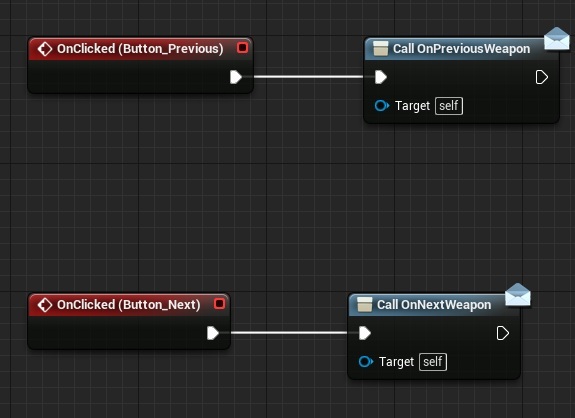 And one new variable CurrentWeapon – extending from BP_BaseWeapon. Add two buttons: Button_Previous and Button_Next. We will be calling this from actor placed in world. This will take lot of time because I need to add lot of new variables. This part would be so much easy in C++ 🙂 You won’t be getting any results soon but I will move from one upgrade to another. Let’s start with 3D weapon. 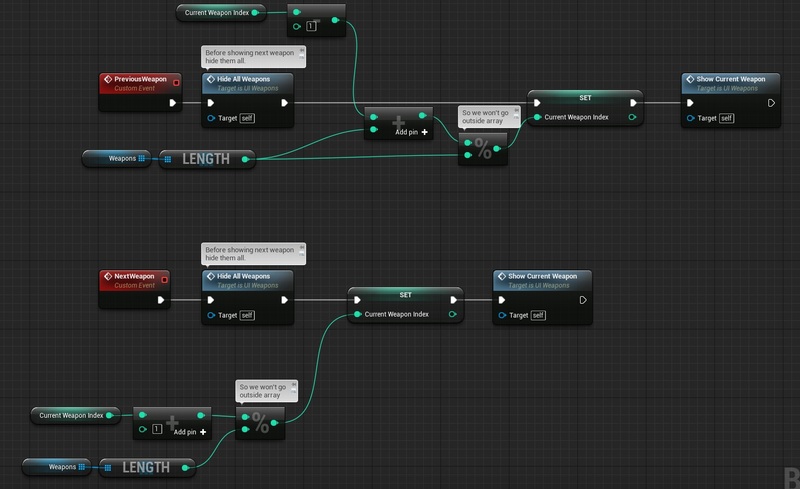 Create new blueprint extending from Actor named UI_Weapons. Open it. You should see your buttons in components view. Rotate. As you can see this is adding rotation to WeaponsRoot scene component. ActivateUI. This is making sure we will have mouse and be able to click on UI. ShowCurrentWeapon. Make sure we are only showing current weapon. Update UMG about new current weapon. SpawnAllWeapons. This event will spawn all weapons from GameInstance array. NextWeapon and PreviousWeapon. Update CurrentWeaponIndex and call ShowWeapon. BindEvents. Just bind dispatchers from our UI. Thanks to this we have communication with UMG and this actor. As you can see each time someone will tap Next Button we will call Next Weapon function in this Actor. You could place this actor on your level near camera and test it out – your 3D meshes should change after tapping on buttons in UMG. First let’s move with Ammo In Mag upgrade. This is how I’m calculating cost – it will be used for all upgrades. 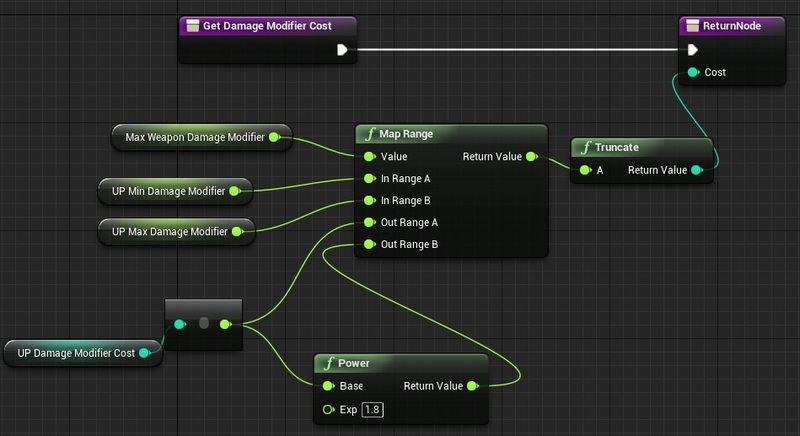 What you could do is to change Exp in Power or overwrite this function in specific weapon. So basically each time you upgrade ammo in mag cost will increase. Open UI_Amory_Weapons. I won’t be showing you how to create UMG from scratch. Will try to trigger modular creation. As you can see in screens there are 8 variables that I’m upgrading. What you could do is to create just ONE widget then copy 8 times. This basically is updating all widgets. Rest upgrades will use almost the same event but with different variables. Run the game and check if you are able to upgrade ammo in mag. If not – try to debug it by placing print strings. Try to search where is the problem. This is identical as Upd_AmmoInMag just with different (highlighted) variables. Go to UpdateAllData function and call this event. UpgradeDamageModifier. This time we will call this function from UMG instead doing math in UMG. This will be exactly the same as damage modifier but with different variables. Try to do it by yourself without my help. The same as above – try to create it by yourself. As you can see I’m adding couple of variables and making sure they won’t go outside clamp values. And now you can upgrade accuracy. 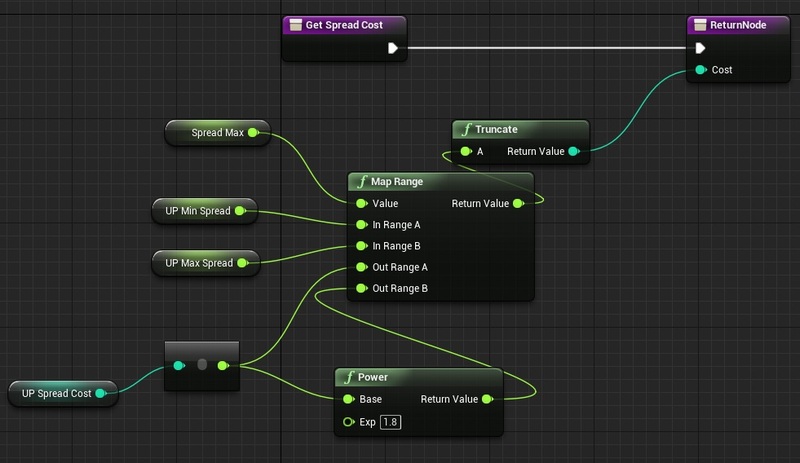 Create new Graph named Update_FireRate. Then add new custom event named Upd_FireRate. If RifleFireRate is 0 I’m hiding whole horizontal box. Now you can upgrade all 8 variables! And that’s it! You should get good starting point to work with visuals and other upgrades mechanics. As you saw – lot’s of copying, lot’s of variables – easy but really time-consuming. As always – take your time! 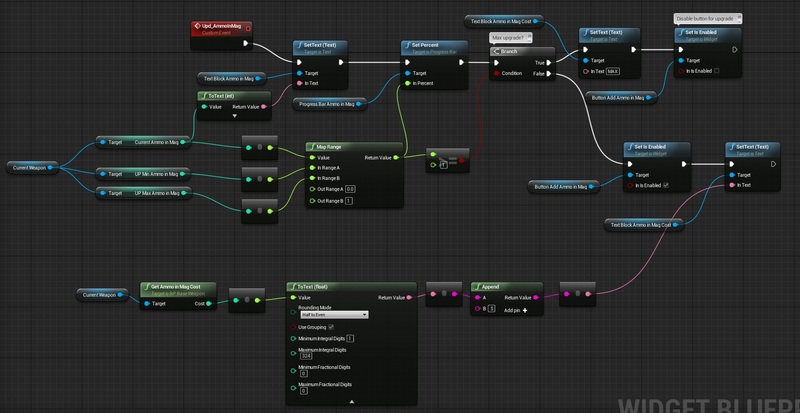 Try to use Print node to check what’s missing, maybe your mesh is null in ShooterGameInstance. Say I were making a game where you could have multiple of the same kind of weapon, would this system as is handle each separately? For instance, would I be able to have one pistol with max damage, one with max fire rate, and one that’s completely unmodified? Hey Tom, in some versions of the Editor this 3d version of the menu widget won’t work. In 4.10 I had to set it to “ScreenSpace” in the UI_Weapons blueprint to be able to interact with it. Based on some googling, 3d menus like the ones illustrated here broke at some point, and I’m not sure they’ll be fixed anytime soon. When you get that far, you’ll notice that nothing happens when you press the buttons. First, make sure WeaponsRoot is definitely in the camera view by attaching a mesh to it within the blueprint, and – also from within the blueprint – positioning it manually where you want it. 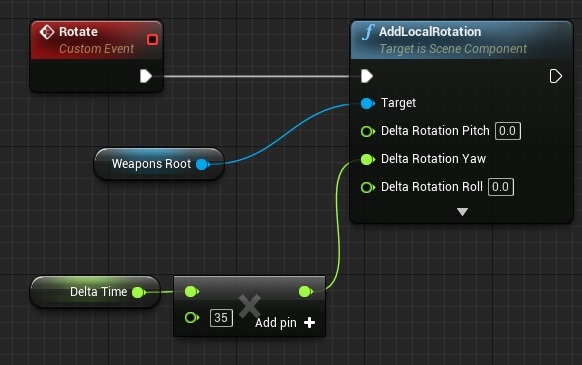 So you’re moving it around in the blueprint viewport to place it correctly in your scene (alternatively, you could reposition your widget and leave the WeaponsRoot at the center of your blueprint so you can drag UI_Weapons directly to where you want the weapons to show up). Next, select each of your weapons and ensure UI Scale variable is not zero. I had to set mine to 25, but I’m using all my own models, your value will vary. Previous PostPrevious 100 000 views. Thanks!